Not to be confused with its successor, Bosnia and Herzegovina or that state's constituent, the Federation of Bosnia and Herzegovina. "You are the one and only"
The Republic of Bosnia and Herzegovina (Serbo-Croatian: Republika Bosna i Hercegovina / Република Босна и Херцеговина) was the direct legal predecessor to the modern-day state of Bosnia and Herzegovina. The Republic of Bosnia and Herzegovina existed legally until co-signing the Annex 4 of the Dayton Agreement, containing the Constitution of Bosnia and Herzegovina on 14 December 1995, but official documents reveal that the state existed until the end of 1997 when the implementation of the Dayton Agreement was finished and only then it fully came into effect. Most of this period is taken up by the Bosnian War, in which majority of population of two of three main ethnicities of Bosnia and Herzegovina, namely Bosnian Serbs and Bosnian Croats, established entities of Republika Srpska and Herzeg-Bosnia respectively, which were unlawful and secessionist in nature hence unrecognized by international community. Informally these events were considered by nationalists as evidence that republic was left to be representative primarily of its Bosniak population, formally presidency and government of the republic was still composed of Bosnian Serbs, Bosnian Croats along with Bosniaks. By the Washington Agreement of 1994, however, Bosniaks were joined by Bosnian Croats of Herzeg-Bosnia, which was abolished by this agreement, in support for the Republic by the formation of the Federation of Bosnia and Herzegovina, a sub-state joint entity. In 1995, the Dayton Peace Accords joined the Federation of Bosnia and Herzegovina with the Serb entity, the Republika Srpska, from that point onward recognized formally as political sub-state entity without a right on secession, into the state of Bosnia and Herzegovina. Alija Izetbegović during a visit to the United States in 1997. The 1990 parliamentary elections led to a national assembly dominated by three ethnically based parties, which had formed a loose coalition to oust the communists from power. 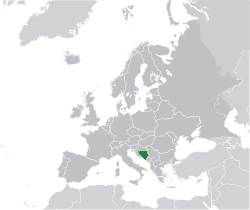 Croatia and Slovenia's subsequent declarations of independence and the warfare that ensued placed Bosnia and Herzegovina and its three constituent peoples in an awkward position. A significant split soon developed on the issue of whether to stay with the Yugoslav federation (overwhelmingly favored among Serbs) or seek independence (overwhelmingly favored among Bosniaks and Croats). A declaration of sovereignty in October 1991 was followed by a referendum for independence from Yugoslavia in February and March 1992. The referendum was boycotted by the great majority of Bosnian Serbs, so with a voter turnout of 64%, 99% of which voted in favor of the proposal, Bosnia and Herzegovina became a sovereign state. While the first casualty of the war is debated, significant Serbian offensives began in March 1992 in Eastern and Northern Bosnia. Following a tense period of escalating tensions and sporadic military incidents, open warfare began in Sarajevo on 6 April. International recognition of Bosnia and Herzegovina meant that the Yugoslav People's Army (JNA) officially withdrew from the republic's territory, although their Bosnian Serb members merely joined the Army of Republika Srpska. Armed and equipped from JNA stockpiles in Bosnia, supported by volunteers, Republika Srpska's offensives in 1992 managed to place much of the country under its control. By 1993, when the Croat-Bosniak conflict erupted between the Sarajevo government and the Croat statelet of Herzeg-Bosnia, about 70% of the country was controlled by the Serbs. In 1993 the authorities in Sarajevo adopted a new language law (Službeni list Republike Bosne i Hercegovine, 18/93): "In the Republic of Bosnia and Herzegovina, the Ijekavian standard literary language of the three constitutive nations is officially used, designated by one of the three terms: Bosnian, Serbian, Croatian." In March 1994, the signing of the Washington accords between the Bosniak and ethnic-Croatian leaders led to the creation of a joint Bosniak-Croat Federation of Bosnia and Herzegovina. This, along with international outrage at Serb war crimes and atrocities (most notably the Srebrenica genocide of as many as 8,000 Bosniak males in July 1995) helped turn the tide of war. The signing of the Dayton Agreement in Paris by the presidents of Bosnia and Herzegovina (Alija Izetbegović), Croatia (Franjo Tuđman), and Serbia (Slobodan Milošević) brought a halt to the fighting, roughly establishing the basic structure of the present-day state. The three years of war and bloodshed had left between 95,000 and 100,000 people dead and more than 2 million displaced. Sarajevo issue RBiH passport; and Zagreb Embassy issue RBiH passport. In October 1992, a limited number of Republic of Bosnia and Herzegovina passports were printed and available to its citizens. The document allowed the holders to enter and leave the newly formed country legally as well as other nations traveled to. The Republic's official documents and passports were valid until the end of 1997 when the implementation of the Dayton Agreement commenced the modern-day state of Bosnia and Herzegovina. The R. BiH passports were replaced by Bosnia and Herzegovina passport and Bosnian-Herzegovinian identity card. RBiH Elementary School wartime student report card. During the Bosnian War, schooling continued primarily in major cities. In besieged Sarajevo, schools operated in dispersed basement classrooms in neighborhoods across the capital city, under the constant threat of enemy guns and mortar fire. Depending on the part of the country, teaching staff needed to adjust to the war circumstances, and classrooms were often held in houses and hallways. In some places, the school buildings were even turned into refugee camps, hospitals or military headquarters. In 1992-93 school year, the subjects and curriculum were closely linked to those from Socialist Republic of Bosnia and Herzegovina period. However, education in the war had many shortcomings, such as unstable infrastructure and a lack of teachers, as well as a severe lack of textbooks. The names of many schools in Sarajevo were changed throughout the R BiH period and remain changed even today (present-day Bosnia). The Ideology of socialist Yugoslavia and achievements of the National Liberation Struggle altered many school names, especially those named after predominantly non-Bosniak historical figures. Only 3 schools from roughly sixty in the capital were changed. Seal of the Army of the Republic of Bosnia and Herzegovina. Army of the Republic of Bosnia and Herzegovina were the armed forces of the Republic of Bosnia and Herzegovina during the war in Bosnia and Herzegovina. ARBiH was established on 15 April 1992, and most of the structure is transferred from the former Territorial Defense of Bosnia and Herzegovina. The Army after the Dayton Agreement was defined as the Bosniak component of the Army of the Federation of Bosnia and Herzegovina, and after defense, reforms transformed into the Bosnian rangers, one of the three brigades of the Armed Forces of Bosnia and Herzegovina. Following the introduction of the Bosnian dinars and replacement of the Yugoslav dinar, Bosnian dinar was in circulation in most of the territory controlled by the Army of the Republic of Bosnia and Herzegovina. The areas under Croatian control used the Croatian dinar and also kuna, and the Bosnia and Herzegovina territory held by Serb forces, proclaimed Republika Srpska, dinar was also introduced as a means of payment. Shortly after the dinar introduction, Deutsche Mark was preferred as the new means of payment in the Bosniak and Croat dominated RBiH. In present-day Bosnia and Herzegovina the currency is convertible mark which replaced the dinar and German currency in 1998. Euro was used as secondary currency, but was banned on 1 October, but many shops and gas stations privately accept Euro as a currency. The country produced its first stamps since independence in 1993 under the command of the Sarajevo government and began inscribing them as Republika Bosna i Hercegovina. Prior to 1993, newly formed Republic of Bosnia and Herzegovina used SFR Yugoslav stamps but with words sovereign Bosnia over the face of stamp. Mirjana Horvat finished 8th in Final of 1992 Summer Olympics - Women's 10 metre air rifle shooting discipline. RBiH made its debut at Olympics during 1992 Summer Olympics. Republic of Bosnia and Herzegovina women's national basketball team won gold medal at Basketball at the 1993 Mediterranean Games. Ivan Sokolov representing RBiH won 1993 Vidmar Memorial chess championship. Republic of Bosnia and Herzegovina national basketball team finished 8th at the EuroBasket 1993. ŠK Bosna won European Chess Club Cup. Predrag Nikolić representing RBiH won 1994 Tata Steel Chess Tournament. Republic of Bosnia chess team won 2nd place (silver medal) at the 31st Chess Olympiad. RBiH athletes participated in 1994 Winter Olympics. Ivan Sokolov representing RBiH won the 1995 Dutch Chess Championship. RBiH athletes participated in the 1996 Summer Olympics. On 6 November 1996, Republic of Bosnia and Herzegovina national football team defeated a 5th nation in the world at the time and 1994 FIFA World Cup runners-up Italy national football team 2 – 1 in Sarajevo. In the process RBiH recorded their first ever FIFA recognized international victory. On 20 August 1997, Republic of Bosnia and Herzegovina national football team defeated a 3rd ranked nation in the world at the time Denmark national football team 3 – 0 in Sarajevo. ^ "Ustav RBiH.pdf" (PDF). Fondacija Centar za javno pravo. 1993-03-14. Retrieved 2019-03-06. U Republici Bosni i Hercegovini u službenoj upotrebi je srpskohrvatski odnosno hrvatskosrpski jezik ijekavskog izgovora. ^ "CONSTITUTION OF BOSNIA AND HERZEGOVINA" (PDF). The Constitutional Court of Bosnia and Herzegovina. ^ "HUMAN RIGHTS CHAMBER DOM ZA LJUDSKA PRAVA FOR BOSNIA AND HERZEGOVINA REPORT" (PDF). www.hrc.ba. Retrieved 4 July 2015. ^ a b Holbrooke, Richard C. To End a War. Modern Library. ISBN 9780375753602. ^ Hoare, Marko Attila. How Bosnia armed. Saqi Books in association with the Bosnian Institute. ISBN 9780863563676. ^ a b Simms, Brendan. Unfinest Hour: Britain and the Destruction of Bosnia. Penguin Books Limited. ISBN 9780140289831. ^ Bose, Sumantra. Bosnia After Dayton: Nationalist Partition and International Intervention. C. Hurst. ISBN 9781850656456. ^ Vranić, Jelena. The Dayton peace accords: mapping negotiations : based on "To end a war" book by Richard Holbrooke. Fama. ISBN 9789958954917. Retrieved 7 September 2016. ^ Riedlmayer, Andras (1993). A Brief History of Bosnia-Herzegovina Archived 18 June 2006 at the Wayback Machine. The Bosnian Manuscript Ingathering Project. ^ Bugarski, Ranko; Hawkesworth, Celia, eds. (2004). Language in the Former Yugoslav Lands. Bloomington: Slavica Publishers. p. 142. ISBN 0-89357-298-5. OCLC 52858529. ^ "Bosnian war 'claimed 100,000 lives'". Deutsche Presse-Agentur. November 21, 2005. ^ "Hronologija opsade Sarajeva 1992 – 1996". pescanik.net. ^ Stamps of the World. Stanley Gibbons. 2004. p. 392.